The final judicial court of the state. Interpret the constitution and make final decision and judgment for the state. Its rulings are not subject to further review by another court, unless otherwise provided by the constitution. The designations for such courts differ among jurisdictions. Courts of last resort typically function primarily as appellate courts, hearing appeals from the lower trial courts or intermediate-level appellate courts. The primary role of the Amandium Supreme Court is interpreting the Constitution. The Supreme Court of the Amandium has the ultimate responsibility for settling disputes and interpreting the meaning of laws. It also determines what national policy will be when it applies law to specific disputes. 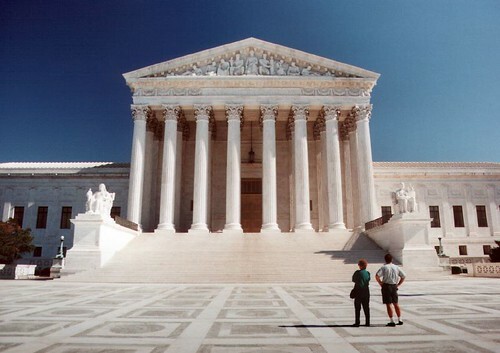 The Supreme Court, the only court created by the Constitution, has the final say on all legal matters that come to it. It is the highest court in our system and there is no appeal from its decisions unless future courts reverse past court decisions. It is the only court that has the final say on Judicial Review -- that is, the constitutionality of a law or action relevant to a case under its review. It has original jurisdiction over cases involving two or more states, and appellate jurisdiction over cases from lower federal courts and the highest state courts (if the state case addresses a preserved national question). Hear appeals from state and national courts. Determine the constitutionality of state laws.